"Alpha Bravo is the latest bot built for Project Aerialbot, and the first to be developed independent of the captured Starscream's blueprints. I don't see much point in an "Aerial"bot who can only hover, but his primeon rotors can slice through more than just air, so I guess he has his uses." i always saw him as an antithesis to slingshot, being calm, collected, polite to an almost absurd degree. Isn't that exactly what the original Alpha Bravo was to begin with? 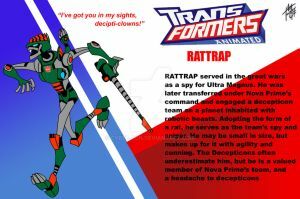 For more info on his personality, tfwiki.net/wiki/Alpha_Bravo. Very nice. And now I'm picturing him as the Autobot version of Offroad. Except, less insane. That's Shattered Glass Alpha Bravo.